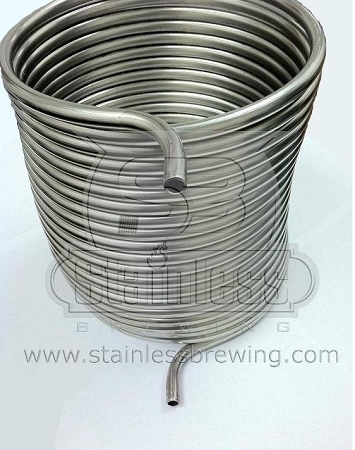 This is your standard HERMS coil with 2 horizontal bends vertically inline. Two holes are required in the side of your kettle for weldless or welded fittings. The tubing is made out of 304/304L stainless and is measured 1/2" OD (Outside Diameter). The coil diameter is a 10" diameter and works great for keggles or other kettles that have a 15-3/4" inside diameter. Anything smaller than this size may require you to drop down to a 3/8" coil since 10" is smaller diameter we can coil with 1/2" tubing. The horizontal bends add about 2-1/2" to the overall diameter of the coil and don't forget the space your fitting connections will take up as well. Using a HERMS coil eliminates the need for a burner under your mash to maintain temperature and it will also help clarify your wort. While you mash, your wort will travel through the coil which is installed in your HLT (Hot Liquor Tank). The HLT will be hot and ready for sparging so you can also maintain your mash temperature with this as well. While your running your wort through your coil your also filtering giving you great clarity. HERMS systems help increase your efficiency and get you the original gravity your trying to achieve. That's not all a HERMS coil can do, it can also cool! Simply fill your HLT with ice and you've creating a cooling coil! The 10" diameter coil measures 10"-11" in height. We recommend waiting for your coil to arrive before you drill the holes into the kettle. I needed a custom heat exchanger to fit my keggle. After exchanging a few emails and pictures of my setup they were able to make the coil I needed and at a great price! This thing is awesome! The coil was exactly as I specified and beats the hell out of trying to bend your own coil and its pretty much the same price! The service was excellent and the shipping was fast! Couldn't recommend Zach over at stainless brewing enough. Dont try to make it, just buy from these guys!!! I got the coil in the mail the other day, I must say I am very impressed!!! I was going to try and make one myself, but was going to spend $200 on a equipment. I found this coil online and its almost the same price as the raw coil you get from mcmaster carr. Workmanship is great and the guys at Stainless Brewing are very accommodating. I wanted someting slightly different and it was no problem. Don't try to make your coil, save the headache and just buy from these guys!!! My system has 20 gallon kettles so I asked Zach to bend me up a custom 1/2" x 50' immersion chiller at 14" coil diameter with garden hose fittings. So it's nice and short...at about 8 or 9 spiral turns. I like to steep hops for 10 minutes at 185* while chilling (nice mellow hop flavor gets picked up) and can barely run this thing before my 15 gallon batch hits 185*. Workmanship is perfect. Be sure to think it through...my "mistake" was the temperature probe is long enough that I had to open a space to slip it in between coils...should have ordered 12" diameter. Thanks Zach for a wonderful product. I should have written this review a long time ago. Zach was very patient answering all of my questions and discussing the custom IC build I was interested in. The chiller turned out great and was exactly what I was looking for. 1/2" custom stainless custom are hard to find and I'm really glad I found Stainless Brewing. I have recommended them to others and will definitely give them my first consideration when I need more stainless gear. The quality, service and fair pricing is outstanding.